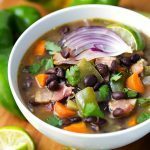 Hatch Green Chile Black Bean Soup is tasty, healthy, hearty, and spicy! It has a little bacon, but just swap it out for a little olive oil, and you’ve got a vegetarian version! 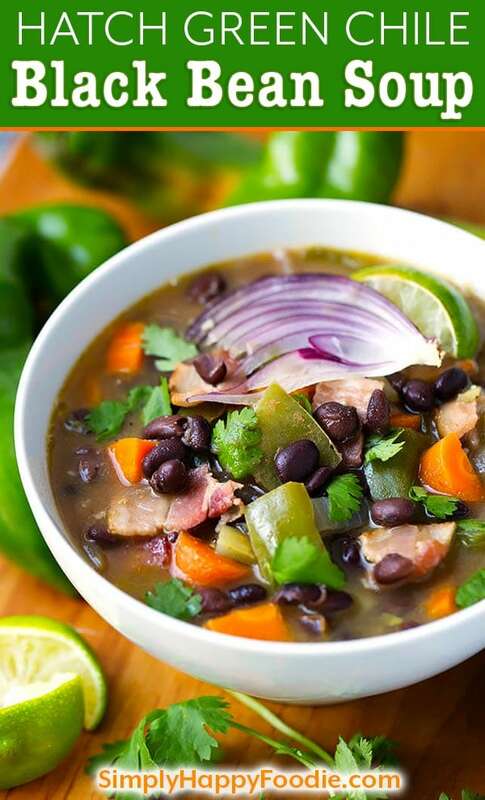 This soup is a great recipe to make with those wonderful Hatch Chiles! This week has been all about the spicy food! Chiles are everywhere I go! So I finally was tempted by some gorgeous Hatch Green Chiles, and took some home. Of course I had 50 ideas for what to make, and then couldn’t decide what to make! Haha, idea overload! I already made some hot sauce, so I opted for a nice pot of my Hatch Green Chile Black Bean Soup. I usually make it with straight bell peppers, but using Hatch chiles raised this soup to a spicy, amazing happy place! It’s spicy, but not too spicy, and has more flavor than heat. This is the perfect Fall soup! For the BEST flavor, you can roast the Hatch chiles in a 400° oven for 20 minutes. I highly recommend it! Hatch chiles are about 6 inches or so long, and they are glossy and firm. If you happen to find some Hatch Chiles in your market, take some home! Even if you don’t use them right away you can deseed and chop them, and pop them in the freezer for when you are ready to make this awesome soup! 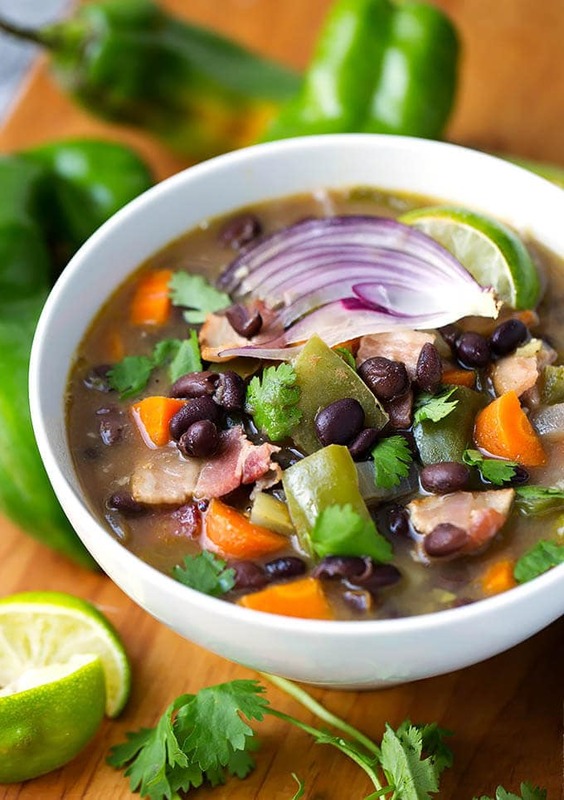 A delicious spicy, hearty soup made from Hatch green chiles, bacon, and black beans. Lots of flavor and easy to make! Omit the bacon to make a vegetarian soup! In a 5 quart or larger pot, cook the bacon until almost crisp. Remove from pot and set aside. Keep the drippings in the pot (If you are doing a vegetarian version, add 1 Tbsp olive oil and proceed). Add the chopped onion and carrot to the pot and cook for about 5 minutes. Add the celery, garlic, bell pepper and chiles. Cook for 2 minutes, stirring occasionally. Add the remaining ingredients. Stir, and bring to a simmer. Cook for 15 minutes at a low simmer, or until the veggies are tender. Add bacon back in and stir. Garnish as you like and serve. 1. Hatch chiles can be substituted with Anaheim chile peppers, though the flavor is a bit different, and to me they are less hot. Still tasty though. You can also find Hatch chiles in a can. They will be soft, so you will miss out on that texture when you bite in to one, but the flavor is good. 2. If you can roast your Hatch chiles in the oven before putting them in the soup, the flavor will be even more amazing! They will be much softer in the soup, but that may be a trade off you like! 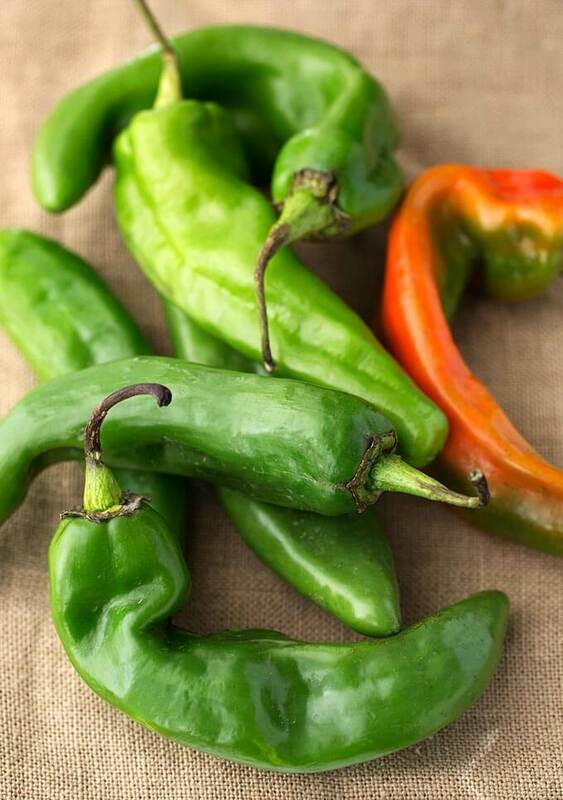 For the BEST flavor, roast the Hatch chiles in a 400° oven for 20 minutes.